Did you know that students in the Social Sciences can also get involved in research? Are you interested in public policy issues and having a meaningful research experience this summer? Then consider applying to be a BIPP Summer Research Fellow. The fellowship award is $3000 to defray living expenses and fellows also qualify for on-campus housing. As a BIPP Research Fellow, you will engage in research with a faculty mentor’s supervision for 8-12 weeks over the summer. To help pair you with a faculty member with a research interest you share, potential Research Fellows should attend the Information Session, Feb. 14, 2019, from 11 – 11:52 a.m. in the Academic West Event Lounge. 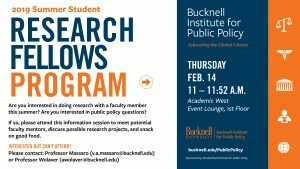 If you are not able to attend this meeting you can request a brochure of faculty research projects from Carrie Ellis, Program Coordinator, at cle005@bucknell.edu and meet separately with several potential faculty mentors to discuss potential collaborations. Lunch will be provided for all who attend.